Updated Tuesday April 10, 2018 by First Colony Little League. We have exciting news from the concession stand. 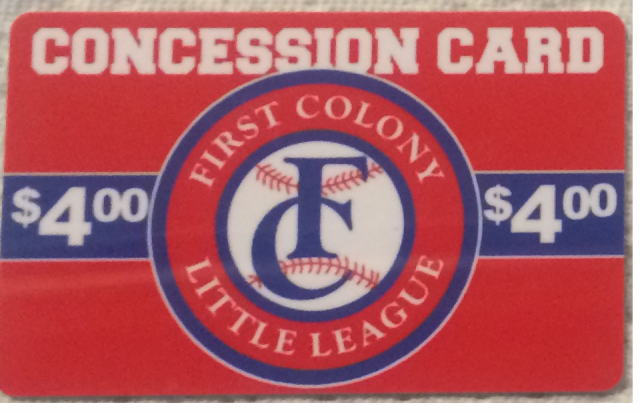 The new $4 concession stand cards have arrived. Come on by and pick some up. While you are there, don't forget about all of the other delicious items like our iced tea, hot dogs, and more. You can always see our specialty menu posted on the wall, right next to the window of the concession stand. Usually we will have extra items on Mondays and Thursdays. Cards are $4 each, purchased at the concession stand. Present the card at one of the concession stands. The team mom could purchase the snack cards prior to the game and distribute to players at the end of the game for thier team snack.